Len Richards & I intended to make our way leisurely to Kaikohe to be on the marae for the last night and the funeral the following day on Wednesday but on Tuesday morning it was announced on the 7am news that Hone Tuwhare was to be interred that afternoon, the same day as Ed Hillary's state funeral. We left an hour an a half later after a plate of bacon and eggs. Just as well as it was a long time before we ate again. It was a sad wee tangi with a LOT of god-bothering. He had four ministers, one made no mention of him specifically, two said they knew nothing about him, only what they had learned the night before from the speeches on the Marae, but there was a Tuhoe guy, Wayne Tekaawa who had trained in Dunedin who knew Hone well. Nice guy. It said on the news there were 150 people. There may have been before the burial but it was more like sixty after the ceremony. No one at the marae knew the Tuwhares as they had left such a long time ago. One of the local speakers even said “apparently he was a great poet" and most of them read poems about god that they had written or came from from other sources (like the Psalms). 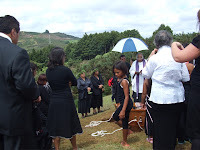 The house was divided more or less equally: the mainly Pakeha visitors on one side and the local Maori on the other and the family at the end where the body lay in an open casket. It was problems with the body in the heat that apparently prompted the bringing forward of the funeral. Hone’s son Rob said many times that this was the end of the hikoi (from Dunedin where 500 people farewelled Hone) and that it was his granddaughter Moana that insisted that he come home. It just did not feel like his home though to a mere visitor. At one point Pat Hohepa welcomed newcomers to the marae but with no waiata and we were told there should have been two speakers. In my mind Hone is as important as Ed Hillary and yet they could not get another speaker for him. There was no mention of his being a boilermaker or a socialist. The local people concentrated on religion. It seemed to be the original family taking him home: Jean (McCormack), Hone’s wife from 1948 until around 1970, their three sons (Rewi, and the twins Robert and Andrew) along with their families. Jean’s younger brother Duncan told Len that he had no time for the arty people and that Jean had not collaborated in the writing of Hone's biography because she wanted to maintain her privacy. At the graveside Len sprinkled some dirt on the coffin and called out: “Hey Hone, have a beer with Marx, Lenin & Mao when you get there” – a reference to the last verse of Hone’s poem Old Comrade written on the death of Jim Jamieson. Two women approached the grave together and said: “This is for you Shirley” as they sprinkled ashes, presumably of Shirley Grace, into the grave. “Together at last,” they said. Ngahuia [previously Volkerling] was probably the only representative of the Maori Writers & Artists. Dun Mihaka was there, as was Tame Iti as a pall bearer although he did not come in for the religious bit. As we wound towards the cemetery I did notice one woman came out to watch but that night in the pub we spoke to a couple of blokes from Dargaville who work with dairy cows (thousands of them) and they had never heard of Hone. He did not want to be buried up north and yet there he was taken to be amongst strangers. According to Janet Hunt’s biography, Hone Tuwhare, published in 1998, his wish was to be cremated and his ashes scattered on the waters of the four harbours he had most connection with – Hokianga, Waitemata, Whanganui-a-Tara and Otakou.